Ever since Shannon Winslow debuted with The Darcys of Pemberley (DoP) in 2011, she’s been an Austen fan-fiction author that I’ve kept on my radar. In the two years since she published DoP I’ve not only read everything else she’s written, For Myself Alone (2012) and Mr. Collins’s Last Supper (2012), but have shared countless conversations with her about life, Austen, and everything in between. She is a woman that truly understands people and deep feelings. It’s easy to understand this without knowing her when you read her latest novel Return to Longbourn. The depth of feeling that the characters go through by the end of the novel is nothing short of astounding. Mary Bennet is happily ensconced at Netherfield Park as the governess for the Farnsworth family. All is well in her life until her father suddenly passes away. Back at home in mourning with her family she realizes how alone she feels. Her sisters Elizabeth and Jane have their husbands to turn to, while Kitty has Lydia. She feels that her only value is to remain stoic and take care of the household while the rest of her sisters fall apart emotionally. It’s this event that triggers a sudden heaviness to her life. When it’s announced that her cousin Tristan Collins (the heir to Longbourn) will be notified of Mr. Bennet’s death, well, that’s when her life turns a bit hectic. Mrs. Bennet announces her plan to have Kitty marry Mr. Collins so that they can remain at Longbourn, while Kitty confides to Mary that she is planning her escape to Pemberley. Mary understands Kitty’s reluctance to enter a marriage without love and agrees to keep their new cousin occupied until Kitty is summoned back to Longbourn. Much to everyone’s surprise, Tristan Collins arrives and is the complete opposite of his odious older brother William in every way. Mary feels herself beginning to fall in love with him and internally questions her decision to live her life without the love of a man. Add to all of this the bipolar friendship she maintains with her employer, the widowed Mr. Farnsworth, and you have the makings of much soul searching. Will Mr. Collins return her feelings? How will Mr. Farnsworth deal with her possible leaving Netherfield Park? Upon first glance, many readers will find this to be a story about love, and in some aspects, redemption. The deeper, more beautiful story to take away from this novel is that of a young woman trying desperately to find her place in a world where she begins to feel valueless. Winslow’s Mary (and Austen’s too) is a stoic individual, not much taken with the fancies of romance, men, balls, or fine clothes. She much prefers to toil her hours away with books and reading. She can at times be a woman of unyielding character, but deep down past this hardened exterior is a woman just like any other. She wants to have purpose, she wants friendship, and yes, she even longs for love. 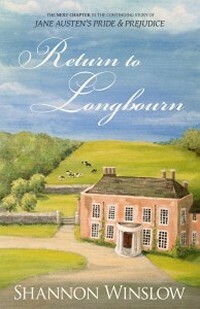 In Return to Longbourn, we see a Mary who is beginning to question the way she has lived her life emotionally. Add to that the grief from her father’s death and the relationships of her sisters and brother-in-laws, and you find a very lost woman indeed. All of this coupled together makes Mary a very relatable character. For who among us can claim to never have felt lost in their own skin and unable to make sense of a multitude of new and unusual emotions? I truly loved how Winslow showcased Mary’s multiple dimensions through her relationships with the other characters of the novel. Her personal connections with her students, employer, cousin, sisters, and mother all helped create a depth to Mary that wasn’t there before. Winslow has mastered the technique of writing like Austen. I can honestly say she’s one of the best writers of the genre, getting not only the language down, but Austen’s tongue-in-cheek humor as well. While a majority of the book has Mary in contemplation of her life, these small sections of humor helped lighten the load of her inner-reflections. This is definitely Winslow’s strongest novel to date and hands down my new personal favorite—possibly due to the Jane Eyre-esque style the story takes on towards the end—which I will leave for the reader to discover. Having also read Shannon’s The Darcys of Pemberley and Mr. Collins’s Last Supper, I have The Return To Longbourne right in my sights. Her love of Jane Austen pours forth from her stories. BTW Kimberly, this is such a beautifully-crafted review…..expressive without revealing spoilers. Mary was the only Bennet sister who would probably have been happy as the wife of her father’s heir: dull, pompous Mr. Collins’, but even he considered her unworthy of consideration. Poor Mary! It’s encouraging to see a story told from her point of view, with the promise of a bit of improvement once she is out of the shade of her four more blessed sisters (even stupid, headstrong Lydia had her moment of “triumph” — thanks to Mr. Darcy’s intervention for Lizzie’s sake). I’ll be looking out for this novel. Agreed! I always love when authors decide to use Austen’s supporting characters as the main focus of new works. As much as I love Elizabeth and Darcy, it’s a refreshing break to step into another character’s life. I agree with Jeffrey in every thing he said. Very well done review. My burning question is this: is it out for us to buy yet? I’m anxious to read it! Thank you! And yes, it is available now! Thanks so much for the lovely review, Kim. It’s been such a delight to share this story! YES! everybody, the book is already available at online bookstores – Amazon and B&N. Pingback: View, ReView, & InterView | Shannon Winslow's "Jane Austen Says..."